Filed Under: Press Releases Tagged With: Acme Armature Works Inc.
Acme Armature Works Inc. in Sheboygan, Wis. is always striving to provide its customers with the best possible service and top-notch products to extend the life of their electric motors. A significant portion of Acme’s commitment to quality extends from its partnership with Helwig Carbon Products Inc. of Milwaukee, Wis., which supplies carbon bearing protectors for a wide range of Acme’s electric and servo motor repair projects. Since premature bearing failure serves as a major cause of electric motor downtime and costly repairs, Acme Armature Works Inc. Owner Chad Bahrs relies on Helwig Carbon Products bearing protection kits to provide his customers with a highly effective method of motor shaft grounding. “We provide Helwig Carbon Products carbon bearing protectors as an option to install on motors that are brought into our shop,” Acme Armature Works Inc. Owner Chad Bahrs said. 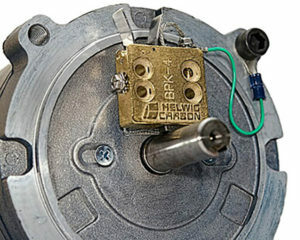 “Variable frequency drives used on AC and DC motors produce induced electrical currents on the motor shaft. The current seeks the path of least resistance to ground, which is typically through the motor bearings. These current pulses often build up and spark through the bearings, which in turn damages them causing excessive noise, vibration and premature failure. Longevity – will typically outlast the unit it is installed on. Most effective technology proven to minimize shaft volute and damaging currents. Provides lowest resistance path to ground. Low to high current carrying capacity. Stock kits fit most motors and multiple shaft sizes. Numerous options for wide variety of conditions. Internal mount options avoid exposure to outside and contaminated environments. 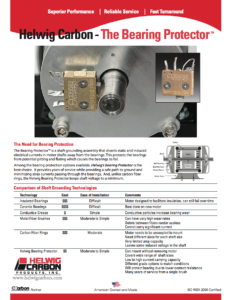 According to Bahrs, Helwig Carbon Products carbon bearing protection kits provide the ultimate level of reliability and efficiency.